Afghans mourn a victim of a deadly suicide bombing that targeted a training class in a private building in the Shiite neighborhood of Dasht-i Barcha, in western Kabul, Afghanistan, Aug. 15, 2018. On Thursday, there was a new attack on the Afghan intelligence service in Kabul. Gunmen launched an attack on a training center on the grounds of Afghanistan's intelligence service in Kabul, a day after a dozens of people were killed in assault on an education institution in the capital. Islamic State has claimed responsibility for both attacks. Bahar Mehr, an advisor to minister of interior told VOA that four suicide attackers were involved in the latest attack on Thursday. He said one bomber exploded himself and three others were killed in fighting with security forces. He said three Afghan security personal were also wounded in cleanup operations but no civilians were harmed. A day earlier, at least 34 people were killed in a suicide bombing attack on Mowoud Academy, in a Shi'ite-dominated part of town. The blast happened when students were taking a university entrance examination. The Afghan Taliban has denied any role in the attack. Earlier in the day, the Taliban raided a military base in Baghlan, in northern Afghanistan, killing 40 security personnel. Almost simultaneously, a group of armed Taliban stormed a police check post near Qalat city in Zabul province, killing several policemen. Several Taliban also died in the fighting. A day before, Taliban managed to seize another army base in nearby Faryab province after two days of heavy fighting. Officials said 40 of the 70 soldiers at the base surrendered to the Taliban. Meanwhile, the United Nations Assistance Mission in Afghanistan warned of dire humanitarian consequences for residents of Afghanistan’s second most populous city, Ghazni, after five days of fighting. 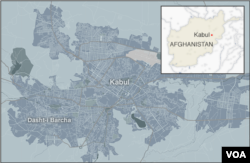 Taliban had launched an attack last Friday and managed to make their way to the city center. Fighting continued in densely populated areas, causing as many as 150 civilian deaths, along with hundreds of Taliban fighters and security personnel, according to UNAMA. The city, about 150 kilometers southwest of Kabul, lost power and faced shortages of food and water. The U.N. Office for Coordination of Humanitarian Affairs said 270,000 people were trapped in the city even as many residents fled town. Hospitals were overwhelmed with the wounded. The fighting has subsided and Ghazni seems to be back under government control. The Afghan news site Pajhwok reported that 70 security personnel have been under siege in central Uruzgan province’s Dehraud district for the past 20 days and likely were to surrender to the Taliban if they did not receive help urgently. Militants apparently have shut down all supply routes to the area, blocking access to both food and weapons. The attacks have dimmed hopes for a cease-fire for the Muslim holy festival of Eid-al-Adha later this month. In June, both the Afghan government and the Taliban announced a three-day cease-fire to mark the end of Ramadan — the first one in almost two decades of war. The flare-up in violence also has occurred after news broke that the United States had started talking to the Taliban directly in order to jump-start a peace process. According to UNAMA, the first half of 2018 was the deadliest for Afghan civilians since the U.N. mission starting tracking civilian casualties in 2009.